Mobile-first indexing would make the biggest noise in the SEO community this year. Also, Google Rankbrain would finally stride in the mainstream, with more people working around its what’s and how’s. And then there are a few of those that, outdated and ineffective, would be done with. They, in fact, must be left behind. We’ve all have enough of them already. Not all backlinks are created equally. Some are great, others do more bad than good. This outlook has put “quality backlinks” in the dead-center of conversations. Not that people don’t look for and get poor quality backlinks. They STILL do. However, quality has become quite a focal point in this department as of late. More people will do away from poor quality backlinks. Since, in coming days, it’ll be becoming more evident that bad link association hurt PR in a big way. External backlinks will become less relevant. Yes, backlink is one of the two most important SEO factors (content being the other one). However, it’s not uncommon to find websites ranking higher on SERP even with fewer backlinks compared to other results. 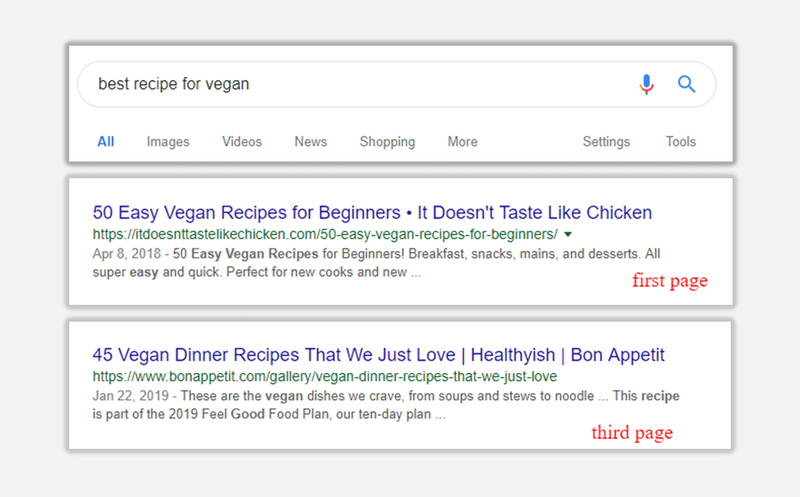 For example, I Googled “best recipe for vegan”. The following two results popped in first and third result pages. 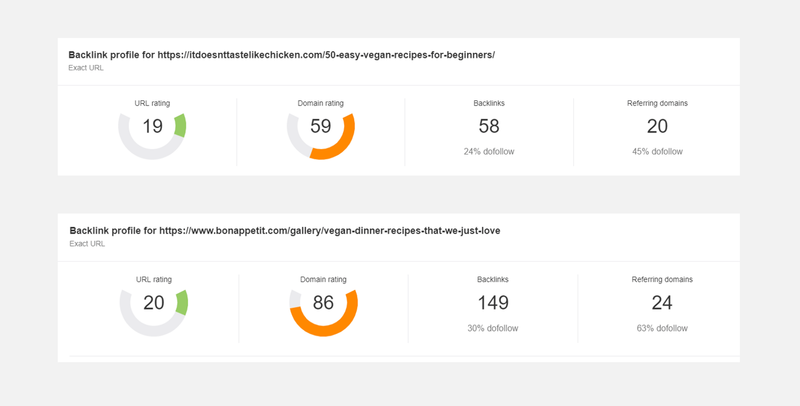 The result on the first page has a fewer number of backlinks (and less Domain Rating) and yet it ranked higher vs. the other one. Indeed, this isn’t concretely conclusive to anything. Yet, it shows backlinks aren’t as big of a deal today as many claims. Also, backlink isn’t a UX-centric factor. And with Rankbrain becoming more prevalent — and Google chasing factors like CTR, Time on Site, Dwell Time, and Bounce Rate more than others — it’s not hard to assume that it may be mellowing down with traditional ranking factors such as backlinks. In addition, let’s not forget that a large part of link building techniques is black-hat, unethical or not legit. 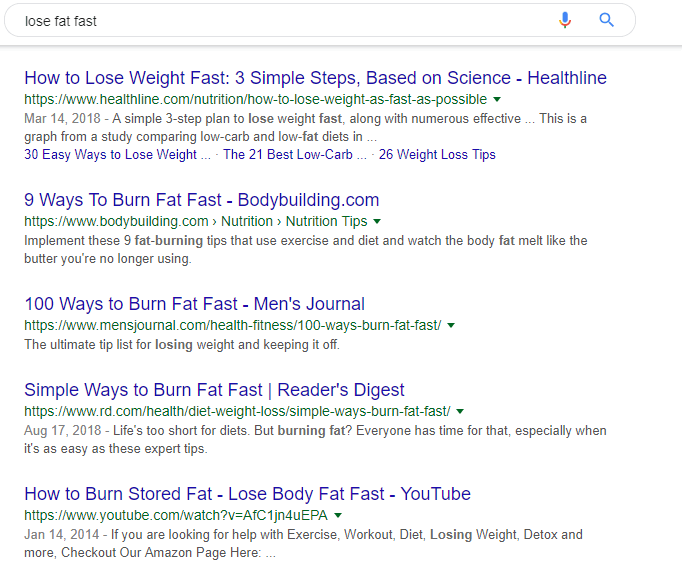 And with search engines more vigilant against such poor practices, it only makes sense that they start prioritizing backlinks less and less. This isn’t to say, naively, that backlinks are dead or doesn’t matter anymore. BUT, link building is definitely isn’t something that it once used to be. And as search engines become more humane in their ranking, backlinks would become less relevant. While this has been a hushed talk for a couple of years now, 2019 might just be the year that it actually starts to pan out in reality. As you can see, no result includes the exact phrase that we searched for. That’s because days to target “exact keywords” are gone. Because search engines are smarter today and they can understand the context of your content even when it doesn’t include the exact phrases that your audience is using to search. In 2019, with LSI keywords and UX-centric ranking factors becoming the major consideration in the SEO community, more people (including me) will finally do away from awkward, forceful keywords like “SEO trends 2019” “best travel agency Malaysia” “Real Estate Investment Los Angeles”. Also Read: How to use LSI keywords to boost your SEO ranking? 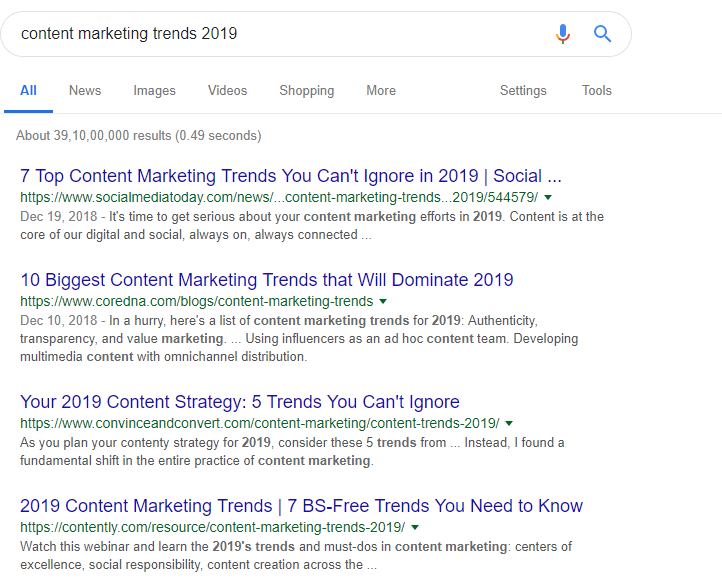 I am targeting “SEO trends 2019” “SEO in 2019” “Latest SEO trends”, so I’ll create individual pages for such keyword variations. Those days are gone — or fast going. Semantic SEO is the talk of the town at the moment. The focus is more on creating topically-centric contents over keyword-centric copies. Search engines are smart to understand the difference and similarity in the variations of keywords. They are well-capable to understand that “SEO trends 2019” and “SEO 2019” are virtually same. They can understand the intent behind the contents. So, publishing multiple articles to target different keyword variants isn’t a great idea today. Search engines will know it’s repetitive. And this will hurt your ranking. Since repetitive, the content itself will be of poor quality. This will hurt your brand. With CTR less and bounce rate high, the ranking will sink even further. Publish a single piece of content around one topic. Include multiple variations of long-tail and LSI keywords in it, wherever it makes sense. Make the content in-depth and quality. STOP shelling contents unnecessarily just because “that’s what the search bots are looking for”. Guest Blogging is one of the most popular off-page, link-building techniques. It is white-hat and quite effective. Since backlinks will become less relevant, guest blogging would become more to do with branding and brand value. This is why brainlessly writing contents for other websites is now the biggest mistake. You need to put in enough thought into it because you’re representing your brand in front of a different — and possibly larger — audience. If it’s poor quality content, the words will spread and your brand value will take a hit. In short, you’ve got to be smart in your guest blogging strategy, going much beyond the backlink intent. Find the right and aptest platform/blog/website. Aim at providing real value to the readers. Put in the right call-to-action. Remember those days when this tip was on every experts’ mouth: “focus on quality and not quantity”? More elaborately, they would suggest that you shouldn’t focus on publishing regularly but instead prioritize the quality of what you’re writing. It’s true. QUALITY IS EVERYTHING. Then, today and tomorrow — always. However, in 2019 and forward, that narration of “quality and not quantity” will take the biggest hit. Today, in the blogging sphere, the mantra is fair and simple: you need to create as many high-quality contents as possible. Meaning, quantity is now equally important as quality. High competition is one of the biggest reasons behind that. Unless you have a very unique and micro-niche, the only way to outdo your competitors is to shell high-quality contents on a very (very) regular basis. And this isn’t just about blog posts. You need to create contents for social media channels and other blogging platforms (Medium, LinkedIn’s Pulse). Collectively, across platforms, in different formats, more high-quality contents would push your brand recognition and search rankings to the next level. So, don’t just publish one blog post a week and relax. You need more — as many more as you can. The more high-quality contents you produce, the higher the chances of you achieving your digital goals. Not that people will entirely stop with directory submission ever. But given a lot of these submission sites are rendered to spam now — and others are charging too high of a price (God knows for what reason) — this factor will lose its count even on the list of off-page SEO techniques. So, in 2019, if you’re still tempted to submit your URLs in C-grade directories, you seriously need to understand the refined fundamental of search engine optimization. We knew it that clickbait headlines will run its course. And this might just be the year for that — at least in the search ranking sphere. Again, click-through rate (CTR), bounce rate, time on site, pogo-sticking — these are UX-based factors that search engine now rely on extensively to rank websites. If your title is misleading, your bounce rate and pogo-sticking metrics will be high, and time on site less. And this will negatively affect your ranking. This is why coming up with authentic headlines for your blog post is more important than ever today. Because search engines would now know based on different parameters if your title is misleading or the article is really as promising as you say in the headline. It’s ludicrous that the idea of ‘keywords proximity’ still exists and writers/bloggers still care about it. At a time when natural language is the Holy Grail for the search engines — and voice search is on the rise — proximities and densities are the last things you would want to care about in SEO. Originally, these concepts were meant to appease the search spiders (and trick them into positively trusting the relevancy of the content). Today, there are no more than useless practices that do no good. And, in 2019, it is high time writers/bloggers stop caring about keyword proximity and density in the name of search engine optimization. You’re producing contents for the users — not for search bots. For as long as it seems fitting and NATURAL, include as many keywords in whatever distance. If you’re really considerate about the readers’ experience, non-repetitiveness would come automatically. Besides this, if you’re thinking about keywords density and proximity even the slightest bit — (i) you’re wasting your time; (ii) you must improve yourself as a copywriter/blogger. It’s incredibly sad to see so many people spend time in creating content and then submitting it to some C-grade article submission sites. There are many flaws to it. The quality of the contents created for such additional or “side platforms” is usually low. Nobody would want to spend time and create good quality contents for these websites. Poor quality content would hurt your brand value. Backlinks coming from poor or shady areas would hurt your SEO ranking. The readership and engagement on these platforms are pretty less. They struggle to retain their own audience. Do you really think they are the right channels that can help your website or brand grow? You would rather spend that time (and some more) to create superior quality, highly engaging contents for standard and established platforms like Medium and LinkedIn’s Pulse, who are fast growing and tout a massive reader base. So, it’s high time now we stop creating (poor) contents for (poor) article submission sites. ‘SEO Agency’ is also the brand name of this company. 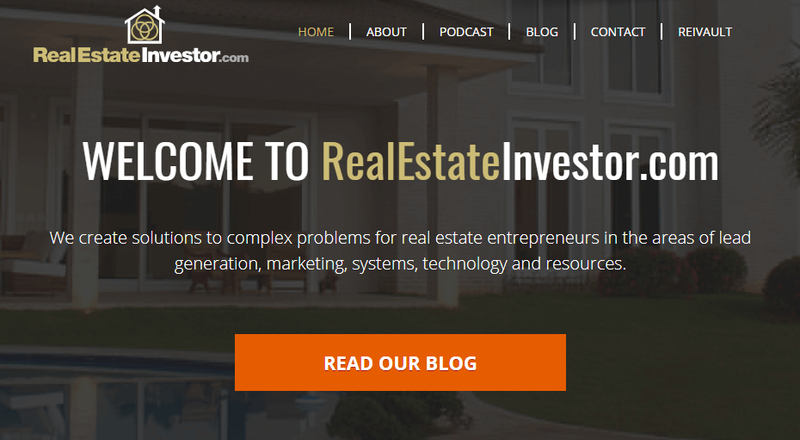 ‘RealEstateInvestor.com’ is the brand name of this company. Aside from the fact that this looks highly unprofessional, the scalability of these brand names is quite less. Plus, these brand names are un-impressing and carry no value whatsoever. Such exact-match domains might have helped these owners a few years back, this doesn’t work anymore. In fact, Google these names and these companies/brand won’t be found even on the second result page. If you’re buying a domain name keeping in view your targeted keywords, hoping that it would help in your search ranking, you’re in for a big shock. This is a time when search engines are prioritizing brands more in their ranking — because good brands usually synonym good offerings. Quick: Google a phrase related to your niche. On the first page, you will largely find the big and highly-renowned brands; very less unknown names. So, DO NOT buy an exact match domain name. And if you’re stuck with one, redefine your branding strategy and change your name. Because in the next couple of years, you’re going to struggle with that silly keyword-based brand/domain name. 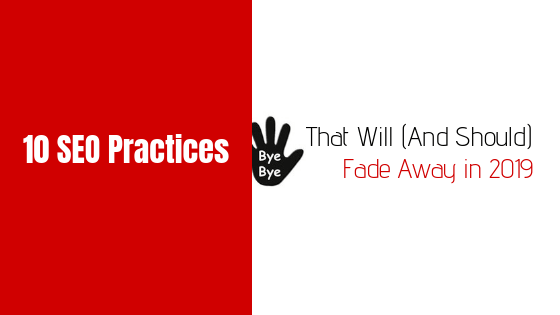 These are 10 SEO practices that will fade away in 2019. Of course, they won’t entirely die. After all, while long been denounced by many, keywords stuffing still happens, doesn’t it? BUT these will get marginalized from the mainstream strategy-making process. And it’s about time that it happens and SEO becomes a standard way a website is managed rather than be just about hacks and tricks.